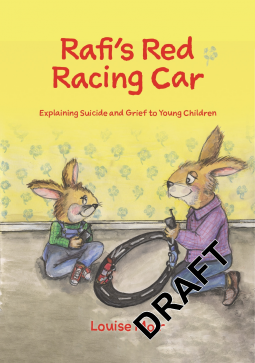 Explaining suicide and grief to young children. It is impossible for Rafi to understand why his dad became so ill in his head, and his thoughts so sad that he decided to end his life. His dad used to be so happy, and loved to play racing cars with Rafi. The red car was always the winner. Red was daddy and Rafi's favorite color. Rafi is angry, and he wants to break his toys, and sometimes he is mean with his friends. He is also scared. Is mom also going to get ill? One day Rafi starts visiting Ellie in a special room at school. Ellie helps him feel better. She understands how Rafi feels, and explains to him that what happened is not his fault. Slowly Rafi starts to enjoy playing with his friends again, and also going to school. He loves his mom, and understands that although it is normal to be sad sometimes, everything is starting to feel right again. Wonderful book to help young kids to understand something it is so hard to understand, even for us adults. It is a sad story, but at the same time is hopeful and wishful. The illustrations tell the story as much as the text. Rafi feelings are so well shown in them! At the end of the book there is a guide to "Help Children heal" rich in information and suggestions to know how to support young kids who are going through this devastating situation. As I have mentioned before, it is great to see more picture books concerned with mental health topics, such as Not Today, Celeste! and Everywhere and all around.